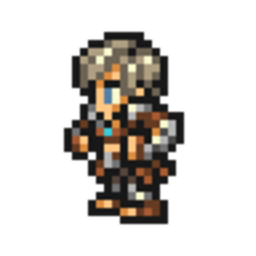 Reks is Vaan's elder brother by two years. He harbors no love of bloodshed, but he willingly joins the Order of the Knights of Dalmasca to defend his homeland in time of war. Reks acquits himself bravely in battle, but he is soon caught up as an unwitting pawn in an imperial plot to assassinate the king. Wields swords and spears. Can use rare spellblade abilities, buffing his Attack to deal powerful physical elemental attacks. Cure (XII)(Reks) Restore a moderate amount of HP to one target. Deal four physical lightning and ice attacks to one target. Deals more damage if the target has a Slight Weakness or is Vulnerable to lightning or ice. Deal four physical attacks to one target, and restore a small amount of HP to one ally proportional to their max HP. Deal slightly more damage with spellblade abilities. Deal significantly more damage when attacking with an enemy's elemental weakness. Attack has a small chance to become Thundering Quadstrike. Moderate chance for spellblade abilities to trigger twice. Small chance to restore a moderate amount of HP to one ally proportional to their max HP when using spellblade abilities. Gladiator Sphere S. Lv.1 +3 ATK Complete the Warrior Sphere. Spellblade Sphere S. Lv.1 +3% Spellblade Ability Damage Complete the Warrior Sphere. Paladin Sphere S. Lv.1 +3 MND Complete the Red Mage Sphere. Snowspell Strike Sphere S. Lv.1 Use 6★ Spellblade Abilities Use 5★ Spellblade Mote x1. Reks Legend Sphere S. Lv.1 +10 DEF Complete the Gladiator Sphere.